Flitecontrol wads defy standard design theories. Federal's Flitecontrol wads extend the effective killing range of standard steel shot. I was hunting ducks on a streambank of the Cheyenne River in southwestern South Dakota. On this fog-laced morning, my shotgun was loaded with a new type of non-toxic ammunition from Federal Cartridge Company in Anoka, Minn. The load was Black Cloud, and even though most of the guts housed in the payload delivery system are quite conventional, the wad is a one-of-a-kind deal. 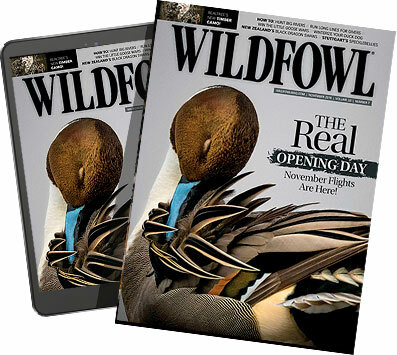 For some of its waterfowl shotshell line, Federal has turned to a wad design consisting of a tough plastic tube lacking any sort of forward-facing wad petals or flaps. Based on a sabot-style configuration, the Flitecontrol wad uses air flaps on the side to stabilize the stiff plastic tube in flight, and a shuttlecock flaring petal system at the rear of the wad, a portion better understood as the gas seal section. When the wad is launched from the muzzle, the payload is trapped in the tube for an instant, and then sent from the wad in a controlled flow. The end result is a "jump" of sorts -- more payload energy and extension in range. I performed tests of Black Cloud shells by shooting the loads in various shot sizes over my Chronotech 33 screens to measure velocity numbers. When compared to loads using conventional wads, the sabot system was moving over the screens faster with more uniform velocity. Further testing by way of ultra-high-speed photographs confirmed the wad was moving about 10 yards downrange and still retaining much of its payload in a tight, uniform mass. On the river that morning with Black Cloud No. 2 shot chambered, I waited for my hunting partners to complete an over-the-decoys crack at ducks, and then sort out the departing targets to test the sabot wad system for additional range extension. As an advanced non-toxic steel load, Black Cloud fills the needs of pass shooters or hunters shooting longer ranges. As ducks climbed out of the kill hole -- in some cases flying almost straight up -- after being shot at by my associates, I confirmed three kills with shots longer than 55 yards. All were stone-dead greenheads in late winter feathering. My field test revealed that Black Cloud, using its "smart wad," was getting the job done by maintaining a tight pattern and good velocity retention. Black Cloud loads hold a tight pattern at long range. Because smart wads tend to perform differently than conventional wads in terms of payload control downrange, the choke needs to be unique. The so-called "stripper wad" chokes should not be used with Black Cloud loads. The raised studs, dog or groves will hinder the performance of the smart wad. You don't want the wad to drop its payload at the muzzle and have the heavy plastic sabot unit run through the shot cloud, thereby tearing it up from the core out to the pattern fringe. Chokes designed specifically for the smart wad system include new developments by Carlson's, Pattern Master (special smooth tube) and True Lock systems. These chokes control the Black Cloud type payload delivery system, and thereby, get the most out of the new, advanced sabot wad. The smart wad can be found in several additional Federal offerings. Heavyweight turkey loads first offered by Federal several years ago use it, as does the previously reviewed 20-gauge turkey killer, and now a brand new Heavyweight Coyote killer in a BB + pellet size. The possibilities in load design and development waiting for the installation of the smart wad system seem endless. Test shooting for patterns with the coyote loads indicates that even out to 60 yards, these payloads can still hold 80 percent patterns by way of my personal Winchester Super X3 and a Carlson's Black Cloud choke tube. I intend to field test the coyote loads while pass shooting geese this fall. To be sure, more information will be revealed in 2010 about this very latest development. Because they lack forward-facing petals, smart wads retain the shot longer after it leaves the muzzle. Will other shotshell manufacturers follow Federal's lead and develop their own smart wad systems? The answer will come at the sporting goods stores in terms of how well loads using smart wads sell in the next couple of years. For the most part, the feedback is positive. Federal will continue to develop new loads using this wad. Getting a handle on what can be done with payload systems in terms of better, more efficient ballistics is an open-ended subject. We have seen clearly how the military can turn a common 12-gauge scattergun into a deadly assault weapon firing darts, mini grenades and paratactic devices. Ammo makers are working with new projectile shape designs for waterfowl loads, and even additional types of materials in the non-toxic field. Smart wads could become a standard, just as conventional plastic wads have done during the replacement of paper wads. Because of improvements in shotshell propellants, wad design and payload development have been able to advance. In the 1970s, achieving proper velocity out of these heavy, massive payload control systems would have been impossible. The powders just weren't up to the task. Pressures jumped fast in shotgun chambers that have never been designed to handle much above 11,000 pounds per square inch. If the wad retains most of the weight, the payload of shot had to be reduced to make up for the added bulk and weight of the wad system. The result of that weight-to-pressure issue produced skimpy patterns and lackluster downrange performance. Today with powders developed by Alliant and other advanced propellant manufacturers, developers have overcome the problems associated with payload lift and excess chamber pressure. Now wad development can move in any direction the designer sees on a blueprint for those new non-toxic shotshell loads. n wad in the 1980s. His system used a double-wall wad and reduced length and numbered slits to gain added pattern effect and retain velocity. The system was very effective. In 10-gauge, it had no equal for many years. Vizecky's contribution to smart wad technology has had a lasting affect on wad development. His basic creative concepts are still very much alive and well. Velocity tables can be adjusted to show just about anything a researcher wants to prove. However, it is clear that smart wads can increase downrange energy, and they are more effective in achieving the maximum performance from each individual pellet -- even standard steel shot. I matched steel No. 2 and BBB Black Cloud loads against Hevi-Steel and a special high-density steel load with some tungsten added. See table above left for test data. The common iron shot loads in Black Cloud wrappers stayed with those loads. The bottom line is that smart wads make even standard steel shot perform to a far higher level than when working with standard wads.